The bathroom is one destination in your home that is simply unavoidable, so why not style it as the picture perfect haven that it deserves to be? The good news is that there are tons of ways to add some contemporary style or quirky humor to your walls that are easy and time efficient. Changing up your bathroom to meet your design goals doesn’t always mean expensive changes or labor intensive renovations (but don’t worry, we’ve included a few DIY tile reno ideas for you diehards!). Sometimes it really is as simple as a new piece of wall decor. 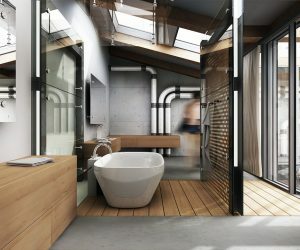 When it comes to your bathroom, your walls are one thing that shouldn't be naked! 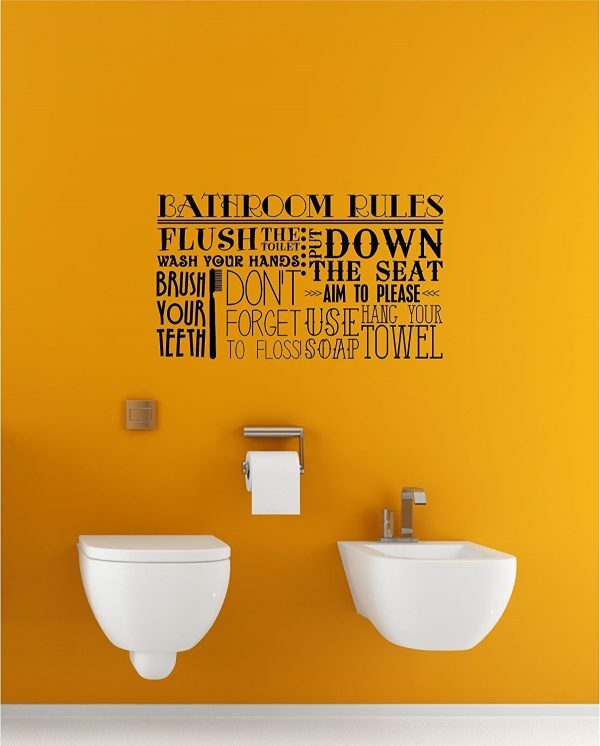 Bathroom Rules Wall Plaque: This bathroom rules wall plaque is not only stylish, but great for kid’s learning about bathroom etiquette. And let’s be honest, I’m sure there are a few husbands that could use the reminder too. 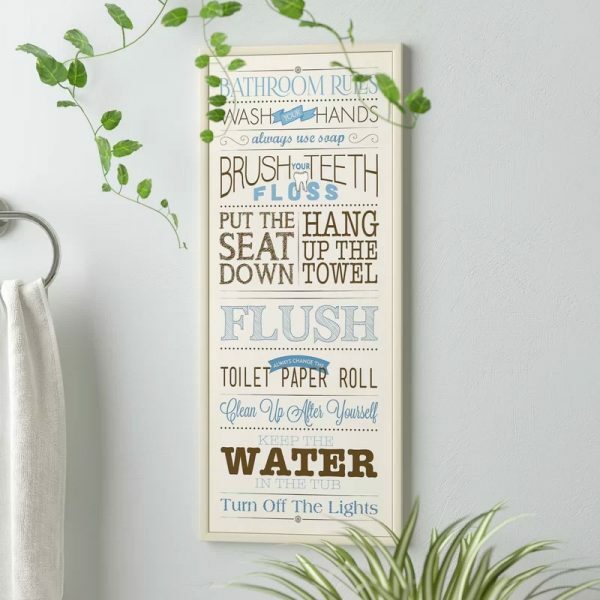 Rustic Bathroom Rules Wall Plaque: Rustic and quirky, this bathroom rules wall art would look ultra cute in a farmhouse styled bathroom. Available in 11″ x 14″ or 13″ x 20″. 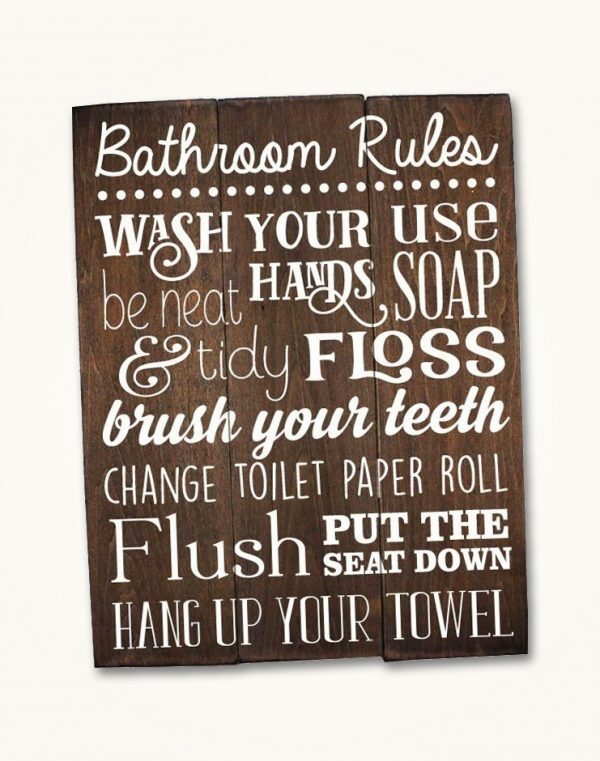 Bathroom Rules Vinyl Wall Decal: Don’t want to deal with a hammer and nails? No problem! Vinyl wall decals are a simple way to add a bit of flare to a space. 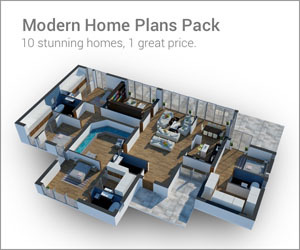 They are especially wonderful for renters that are worried about damaging the walls. 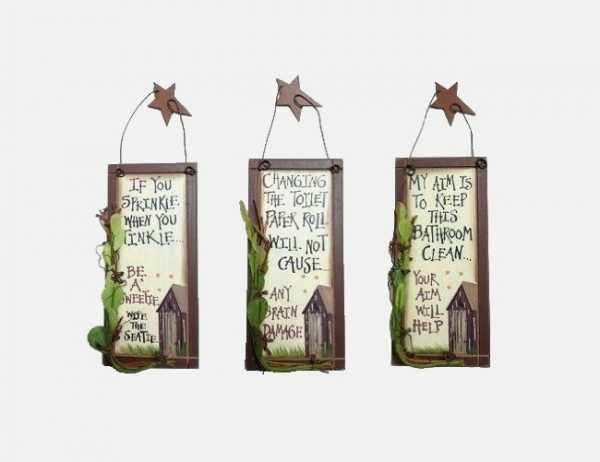 Bathroom Wall Art Set of 3: This rustic wall art trio is injected with both humor and a country chic vibe. The 3D vine decal make this set extra eye-catching. 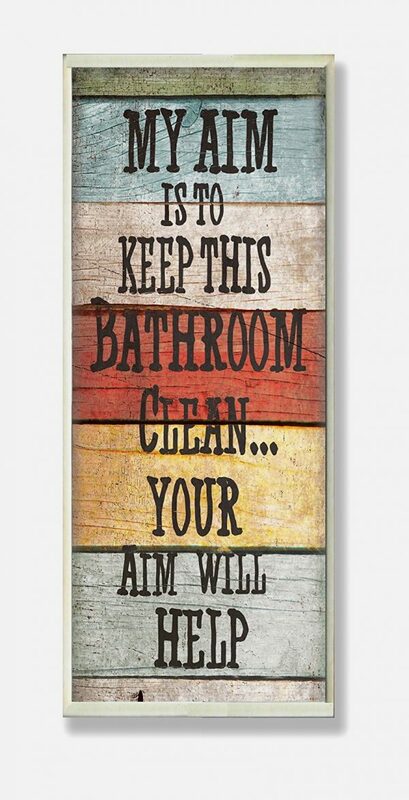 Wooden Frame Bathroom Wall Signs: Bathroom humor presented in a wonderfully chic, modern manner. The wooden frame contrasting against the simple black and white designs are minimalist perfection. 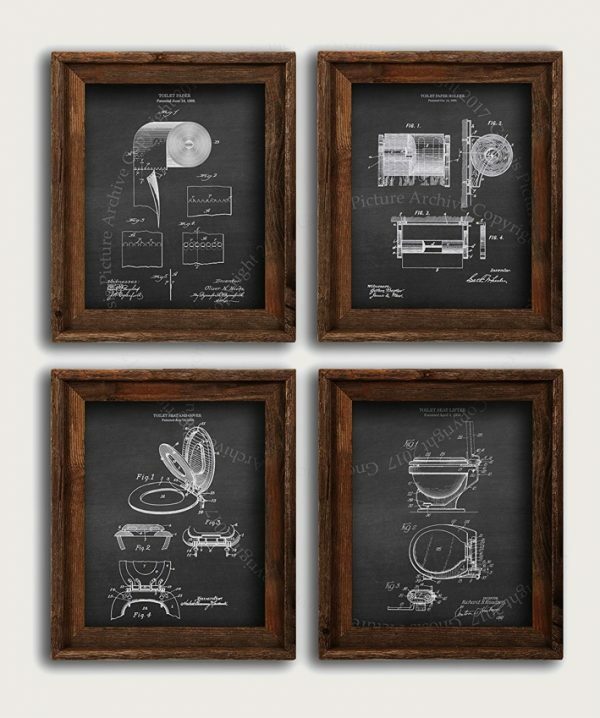 Toilet Utility Patents: Who would of thought that a toilet design patent would make great decor!? These black and white beauties are available as a set of four. 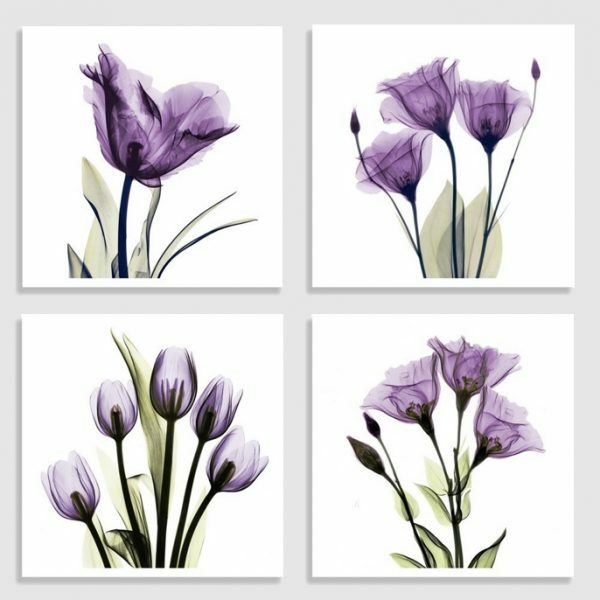 Purple Floral Wall Art: If you are looking for unique, purple wall decor for your bathroom, these may be for you. Aesthetically stunning with their transparent layers, this floral wall art is extra special since it is based on actual x-rays of flowers before being embellished with additional detail. You can see more from the artist behind these magnificent florals here. Sensual 3-Piece Waterproof Canvas Art Prints: Simple and playful, this 3-piece canvas art set is full of femininity and raw sensuality. Bonus, they are also waterproof, so you don’t have to worry about any moisture damage. Soak Relax Unwind Bathroom Wall Art: “Soak. Relax. Unwind.” Possibly some of the best advice we have heard all week. 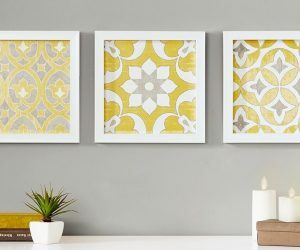 This rustic and modern wall art trio would be a welcome addition to any bathroom looking for a bit more serenity. Abstract Wooden Wall Art: This geometric, wooden wall art is both artistic and earthy with it’s rustic charm. 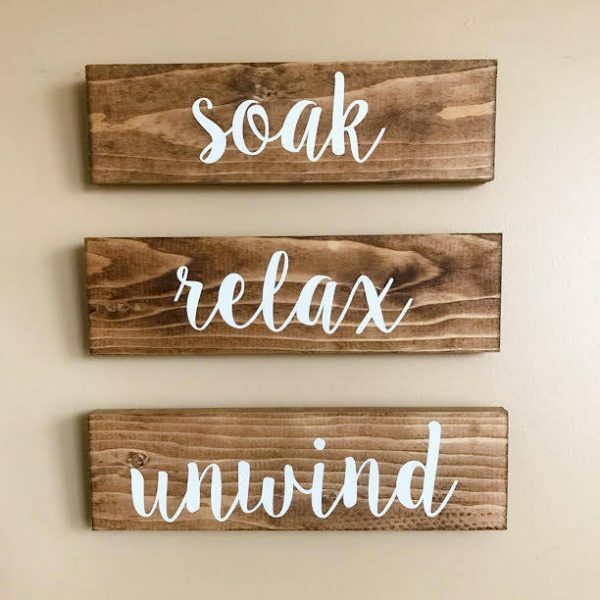 Made from reclaimed wood, these handmade beauties are neutral enough to match almost any decor and are sure to help infuse your bathroom with envious, minimalist style. 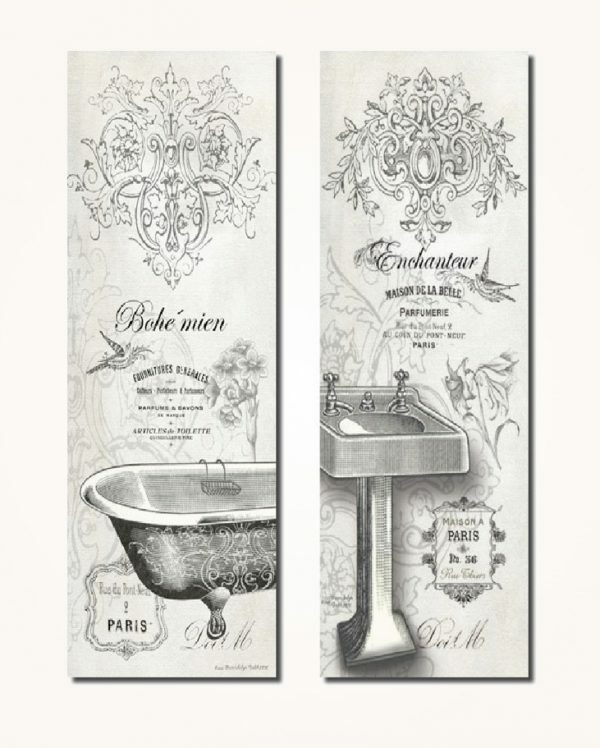 Vintage Style Bathroom Wall Art: Old meets new with these vintage style bathroom prints. This black and white wall art is an affordable way to add a bit of old-style glam to your decor. 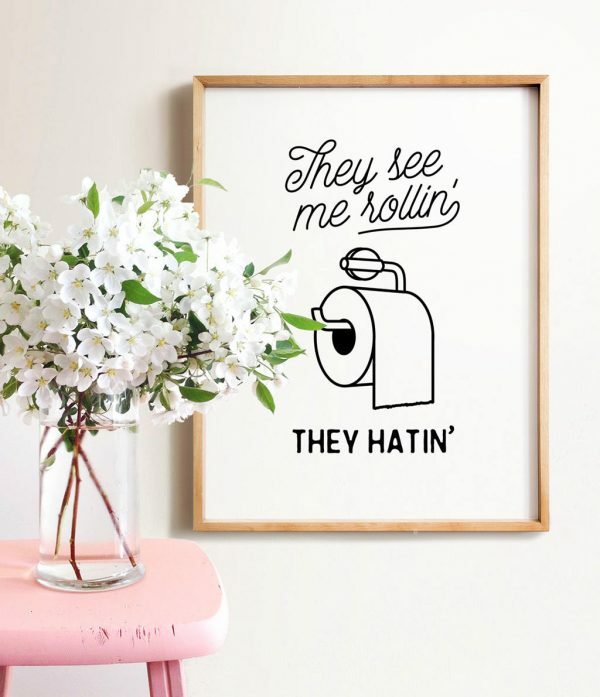 They See Me Rolling Bathroom Wall Art: If you get antsy waiting for mail to arrive like we do, then try some instant download bathroom art. A great example is this hilarious print. All you have to do is purchase and then from there the file will be sent to your email and you can either print it at home or your local print shop. 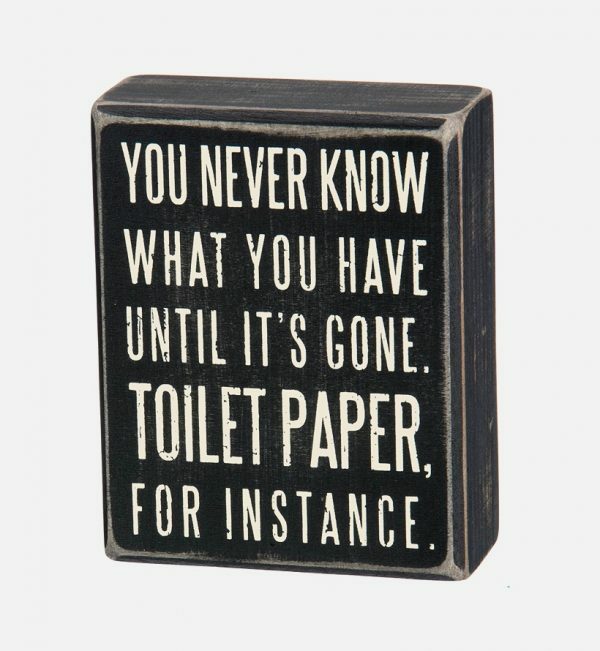 Funny Bathroom Box Sign: This primitive and funny bathroom sign is a small gem that would look great sitting on the counter or a shelf. We love the distressed finish that makes this simple sign subtly more intricate. Funny Dog & Cat Reading Newspaper Wall Art: Reading a newspaper on the toilet is familiar to many, but this bathroom activity is apparently not just for humans anymore. This funny dog or cat wall art comes in a brown, rustic frame and arrives ready to hang. Superheroes On The Toilet Posters: Because even superheroes need a bathroom break. The perfect wall art for a superhero themed kid’s bathroom. Be sure to check out our article, Superhero Home Decor For Themed Rooms & Parties for more superhero ideas and inspiration. Skeleton Bathroom Prints: Skeletons aren’t just for Halloween decor! I’m pretty sure we can all relate to these comical and quirky skeleton bathroom prints. 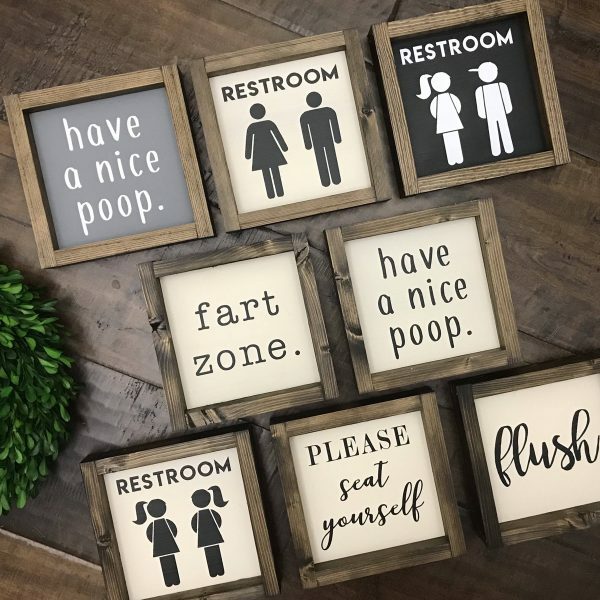 Funny Bathroom Sign: A funny and relatable bathroom sign because let’s face it, we’ve all been there. If you are looking for something humorous, without being over the top, this black and white sign is a no-brainer. 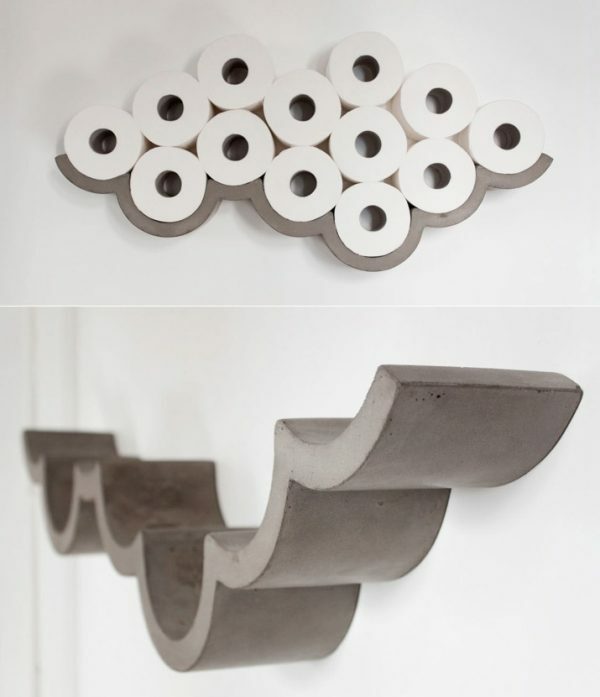 Cloudy Shaped Toilet Paper Holder: This is a piece of wall art that will look stylish either rain or shine. A bathroom essential is taken to the next level with this ingenious cloud shaped toilet paper holder. 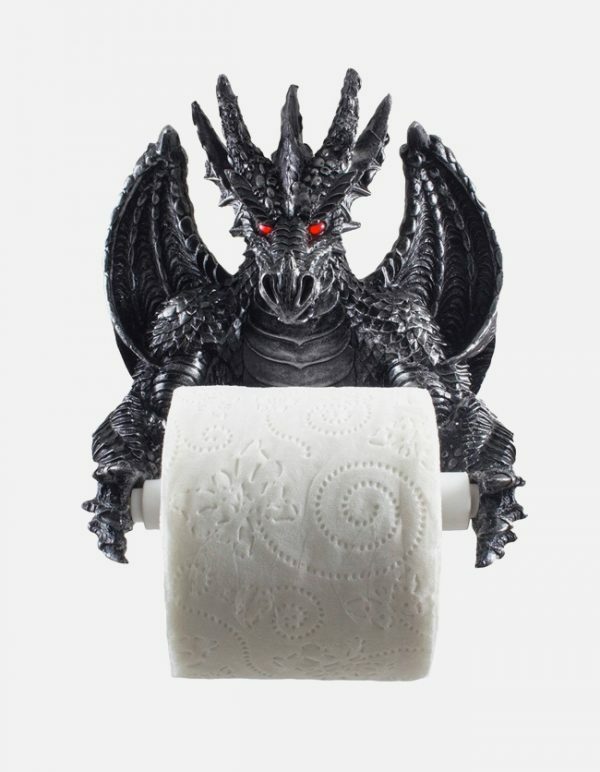 Dragon Toilet Paper Holder: Some dragons are destined to guard gold, this one is the almighty keeper of the toilet paper. If you love dragon home decor, then this medieval masterpiece is a must. After all, wall art doesn’t have to be limited to just paintings and prints. 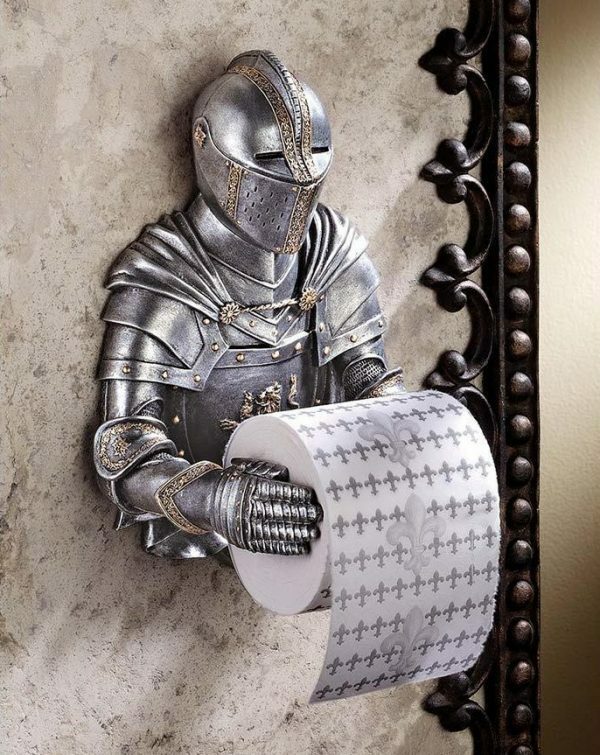 Medieval Knight Toilet Paper Holder: If you don’t trust the Dragon with your toilet paper, what about a noble knight? 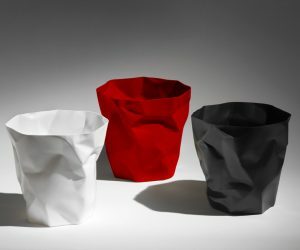 If you want more toilet paper fun, be sure to check out our post on cool toilet paper holders. 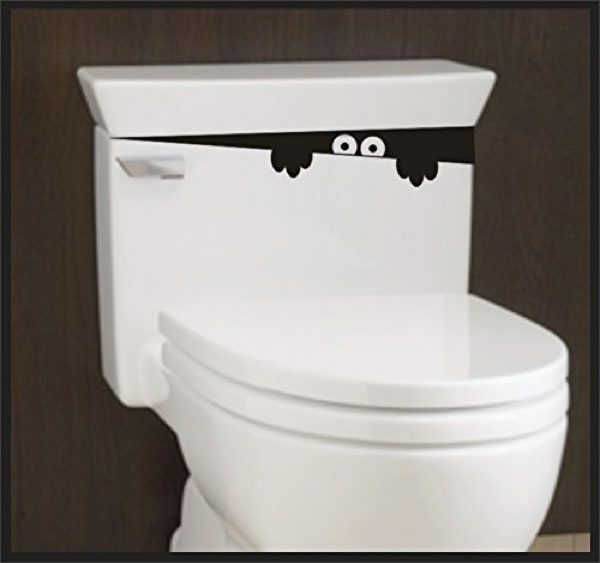 Toilet Monster Decal: Alright, so we realize that this isn’t technically wall decor, but we couldn’t resist throwing him in. A quirky decal with quite the impact. 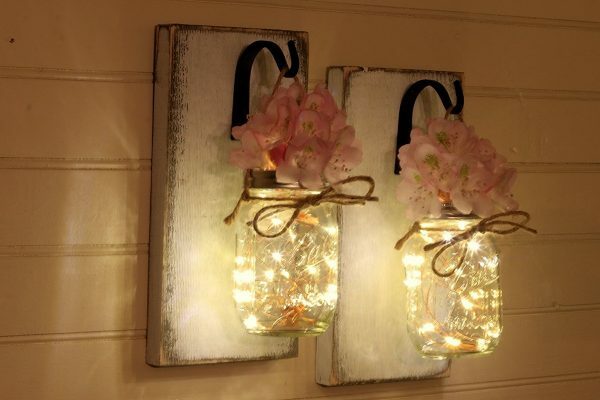 Mason Jar Wall Sconces: If spa-like ambiance is what you are after, then we highly recommend these mason jar wall sconces. Their soft illumination is perfect to pair with a warm, relaxing bath. A great alternative to candles for those who prefer to go flameless. Flip Flop Shaped Wall Hooks: Beach themed wall art that makes us crave that summer sunshine. 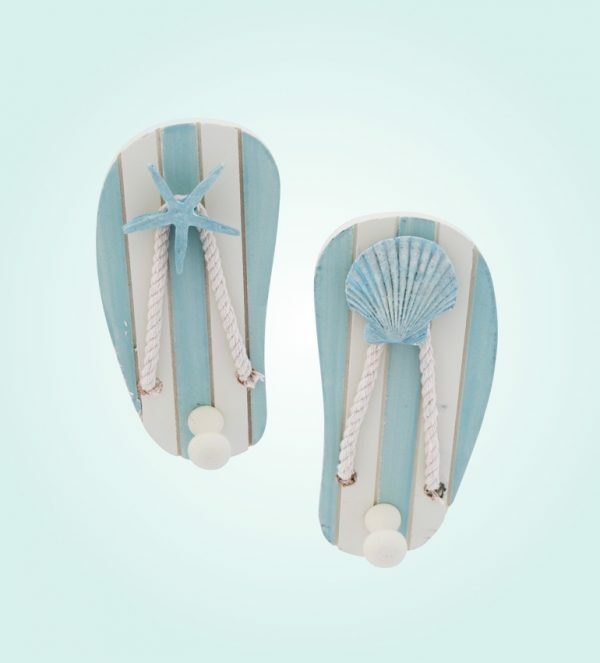 These ornate flip-flops are the perfect tie in for a beachy bathroom. They are pretty useless when it comes to you feet, but are great for hanging up towels and robes. 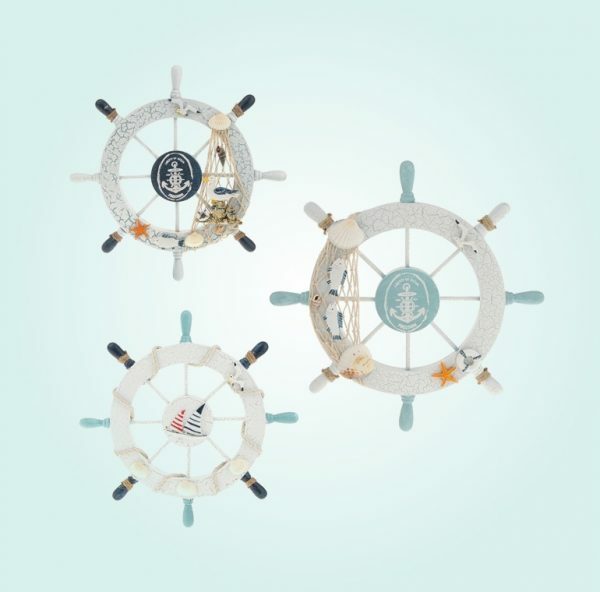 Beach Wall Decor For Bathroom: Be the captain of your bathroom with these fun, ship steering wheels. A piece of nautical home decor that is both affordable and unexpected. 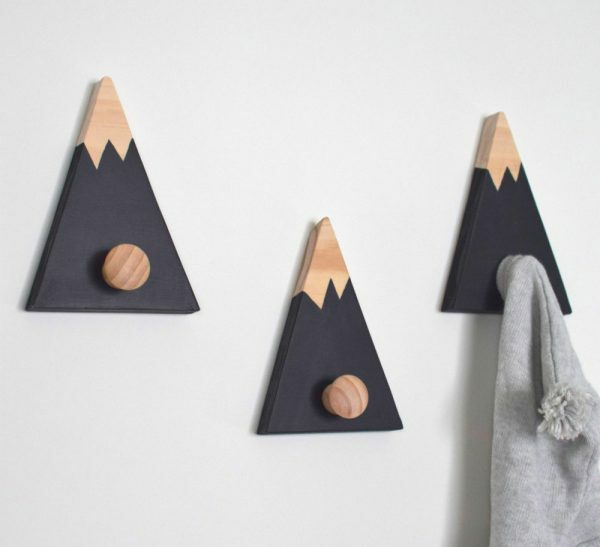 Mountain Shaped Decorative Wall Hooks: Modern, simple, and purposeful. These mountain shaped wall hooks are an exciting find that will take your bathroom decor to new heights. Their color combo is completely customizable, so there is no worrying if they will match your color palette. Decorative Jumbo Clothespin Hook: These may look like clothespins for giants, but they are actually rustic showpieces just waiting to be introduced to your home. 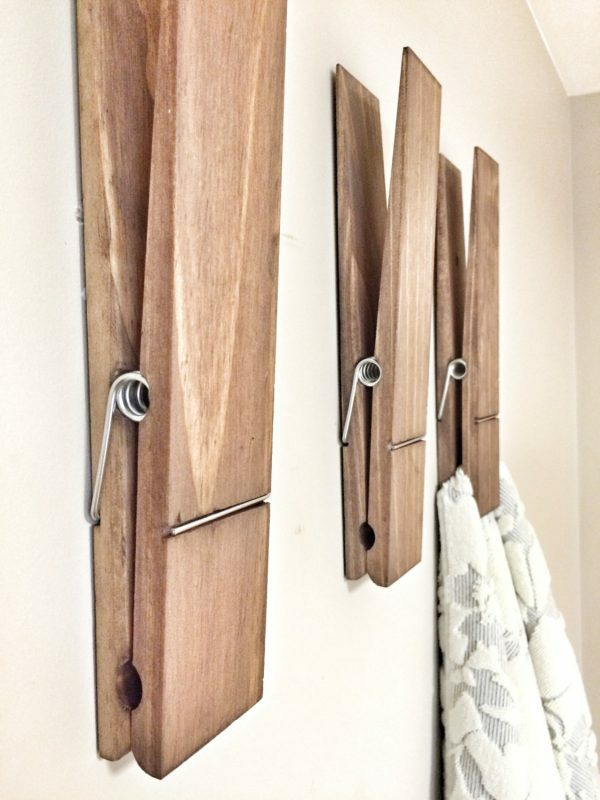 These jumbo clothespin hooks are a unique and unexpected way to add a few more hanging options to your bathroom. 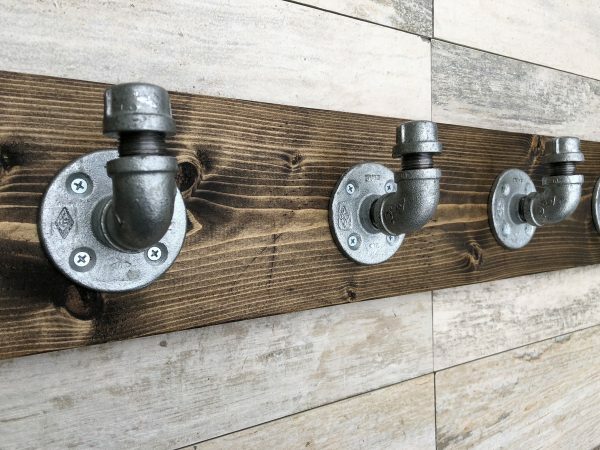 Industrial Style Bathroom Wall Hooks: These rustic, industrial hooks are wonderfully customizable. You can choose how many hooks you need and one of eight wood stain colors. Want more ideas and inspiration? Check out our article dedicated to decorative wall hooks. 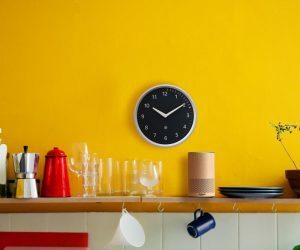 Modern Style Bathroom Wall Clock: If you or your kids are always running late, it might be time to put a clock in the bathroom. 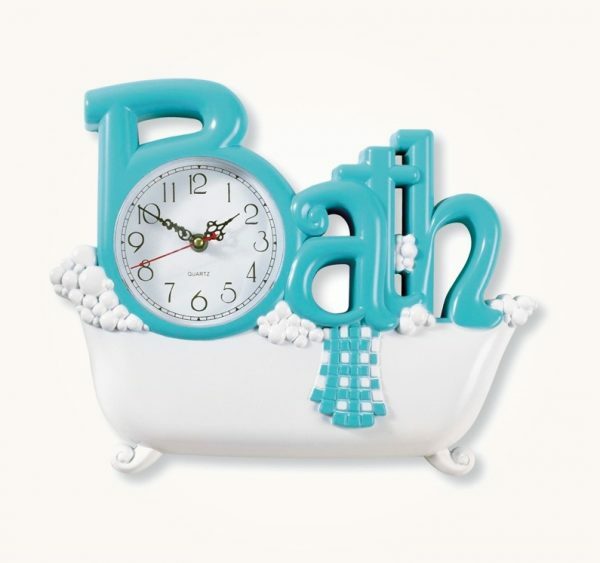 This turquoise and white design is particularly fun with it being in the shape of a bubble bath. 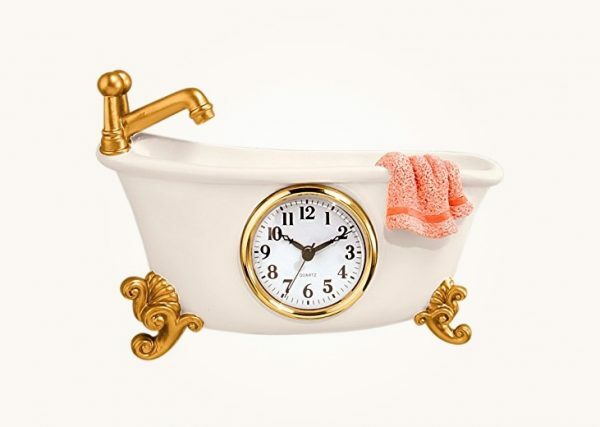 Antique Style Bathtub Shaped Clock: Another bathtub shaped clock, but this time in a more elegant, antique finish. Detailed in gold and a durable polyresin. 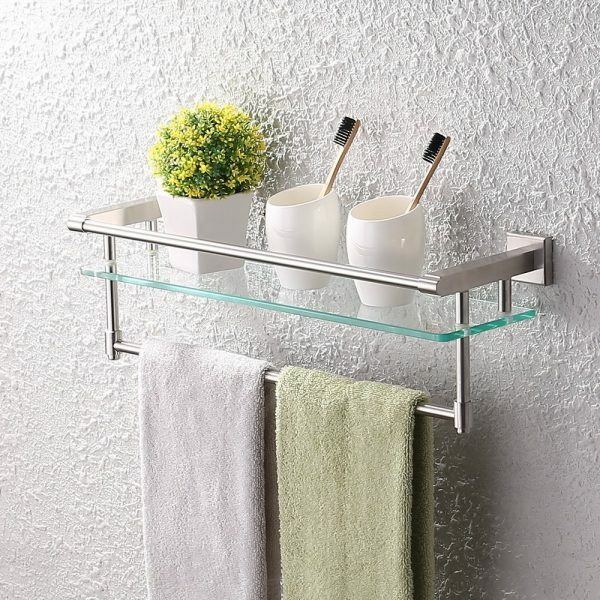 Modern Style Bathroom Glass Shelf With Towel Bar and Rail: Don’t underestimate the power of a simple shelf to liven up a blank wall with just the right accessories. With so many possibilities, this is a fantastically versatile option. Industrial Style Shelving: If you are one to get bored with decor fast, consider shelving. You can theme the shelves with the seasons or change out the decor whenever you please. 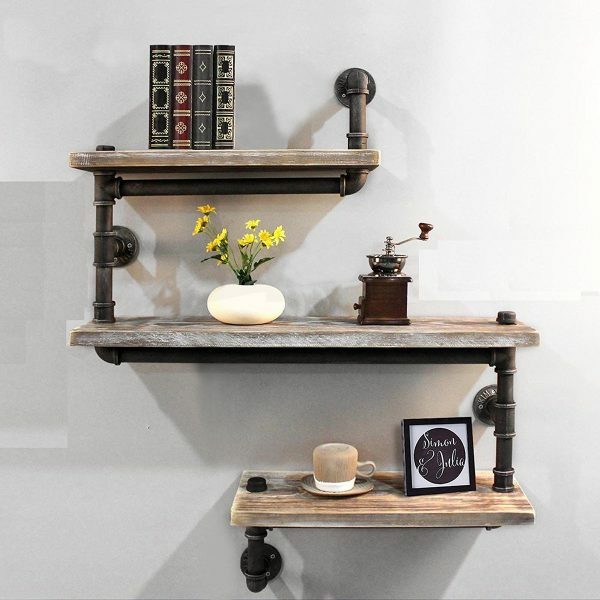 These industrial style shelves are especially chic with their unique pipe and wood design. 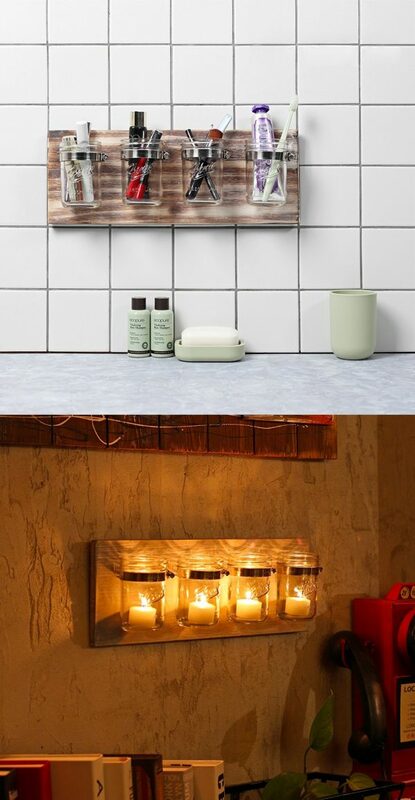 Mason Jar Organizer Set: Mason jar organizers are an asset to any bathroom. Mounted directly on the wall they are a fab solution to keep your counters clutter free. Or if you’re looking to set the mood, they also make amazing candle holders. 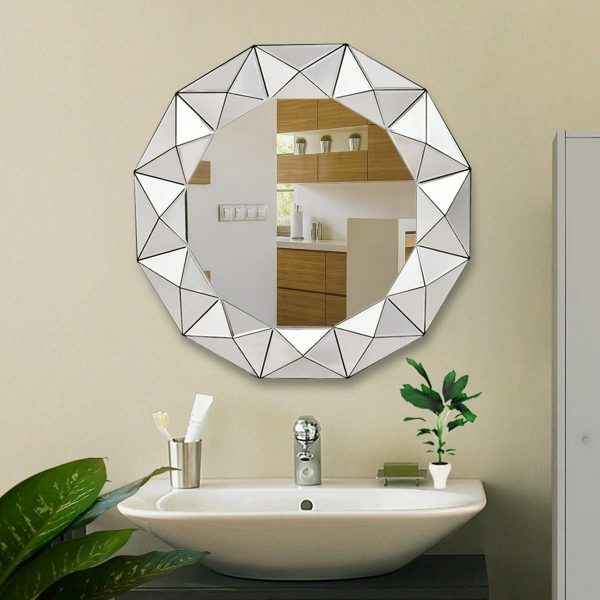 Backlit Bathroom Mirrors: A simple accent piece that is brimming with contemporary elegance. 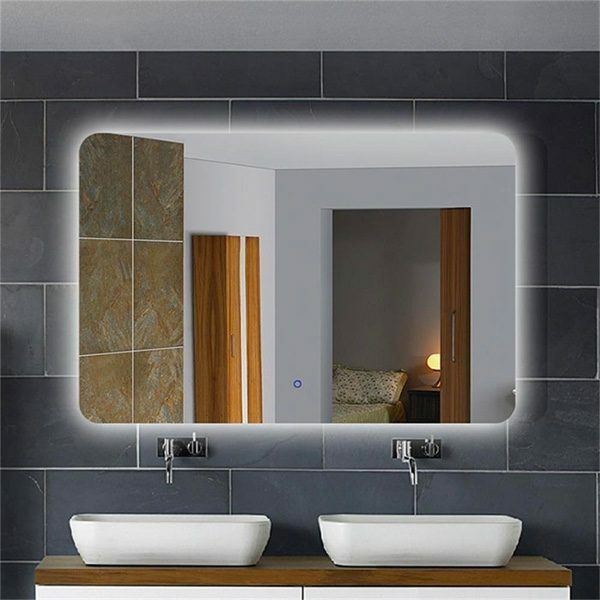 This backlit bathroom mirror makes a big impact with it’s LED lighting system. It is available in multiple sizes. Decorative Bathroom Mirrors: Changing out your bathroom mirror can take your bathroom from plain to radiant with minimal time and effort. This geometric beauty is a great example with its bold shape and design. Interlocking Vinyl Bathroom Wall Tiles: These DIY friendly tiles are easy to install and come with a satisfaction guaranteed. 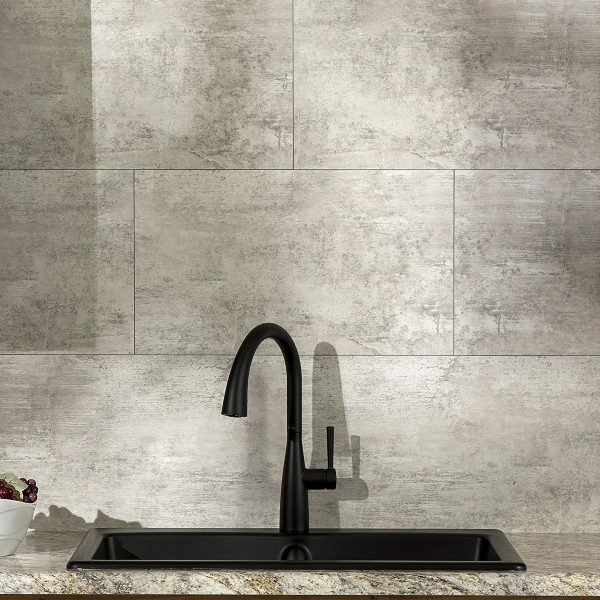 If you are looking to take on your first tile project, these gray interlocking tiles are a brilliant option. 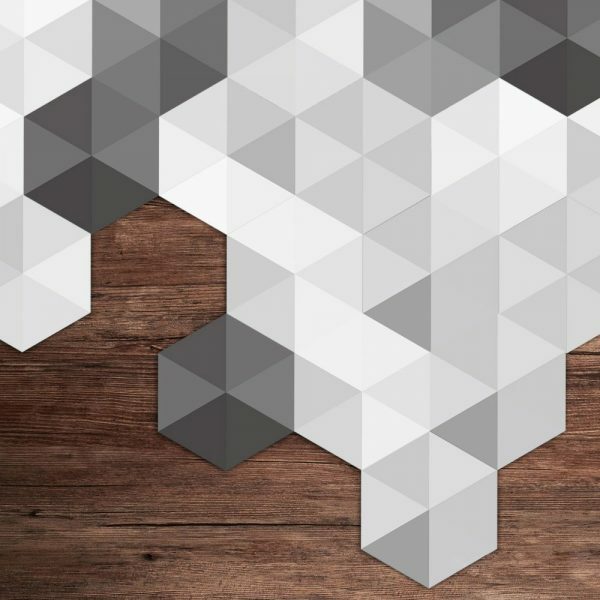 Decorative Hexagonal Bathroom Tiles: Tiling can be quite the task, but these awe-inspiring results are well worth it. 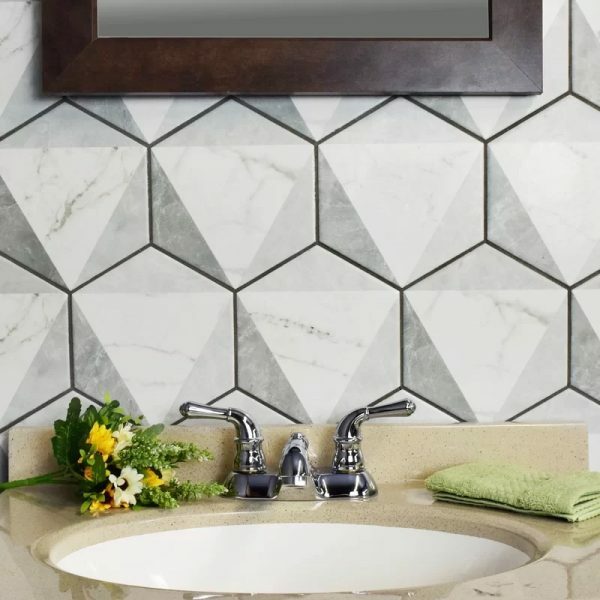 Hexagonal bathroom tiles are simple, yet slightly more ornate than your usual square or rectangular designs, making them a versatile and playful motif for a modern bathroom.